A wine like this (read the review) needs a strong cheese to stand up to the big flavors, but not overpower them. This wine is a perfect match for Reblochon, a great cow’s milk cheese from the Savoie region of France. 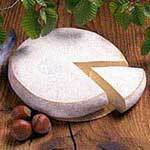 It’s a wash rind, small format — around a pound — creamy cheese with a hint of wet leaf and mushrooms flavors. Some say it has a beefy-ness to it. Make sure you find a cheese that the rind is in good shape, moist, but not wet, and never buy one with a cracked rind. Make sure it sits at room temperature for a least an hour unwrapped, so it can develop all its goodness. Now that summer has officially ended its time for red wine and full flavored cheese!